Iraq & Syria Audio Analysis: Britain To Join Airstrikes — But Does US Have a Plan? Three days after its airstrikes in Syria, the US Government may now be discovering — if if it did not know this from the start — that the attacks are assisting the Assad regime. And Iraq’s Prime Minister Haidar al-Abadi let out a secret: his envoy, National Security Advisor Faleh al-Fayyad, had delivered the message to President Assad — probably in a Tuesday meeting in Damascus — that the regime and its military would not be targeted by the US and allied warplanes. Al-Abadi’s revelation raised an even more interesting question. Had al-Fayyad delivered a similar message on September 16 — a week before the first attacks and a day after high-level US officials promised a “prominent and sustainable campaign” against the Islamic State — in another meeting with Assad? On Monday, as the US carried out the initial attacks, Damascus was still expressing its opposition to intervention, through Foreign Minister Walid al-Moallem. However, after the first attacks a day later, the regime was signalling its support by saying it had been reassured in a letter by US Secretary of State John Kerry — a claim that Washington denied, but one revived by the visits of the Iraqi envoy — of the regime’s security from any airstrikes. 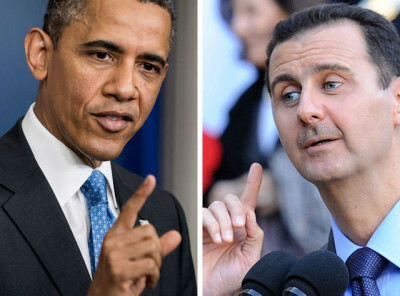 But the greater reassurance may have been the revelation that the US was not only striking the Islamic State but also President Assad’s main enemy: the Syrian insurgency. The heaviest losses on Day 1 — and still the greatest to date — were suffered by the Islamist faction Jabhat al-Nusra, as more than 60 of its fighters were killed by American missiles on an Aleppo suburb and on a village in Idlib Province. 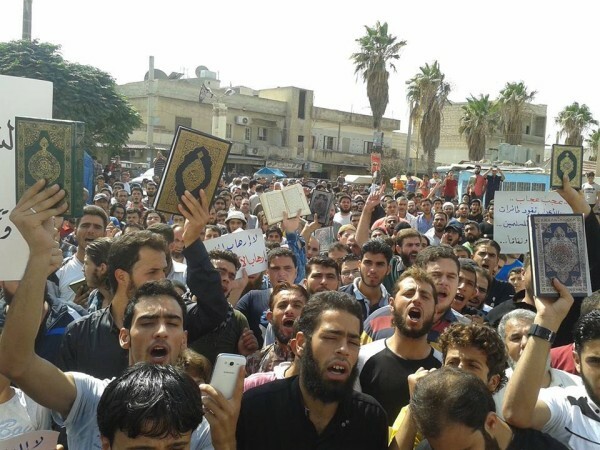 Dozens of protests have taken place on Friday across Idlib Province in northwest Syria, condemning the US approach to airstrikes. The demonstrators demanded that Washington fight the Assad regime as well as the Islamic State, and they expressed solidarity with the insurgent faction Jabhat al-Nusra, struck by the US with scores of casualties on Tuesday. Jabhat al-Nusra and the Islamic Front have issued a long statement explaining their withdrawal from Adra, the city north of Damascus captured by regime forces this week (see earlier entry). The insurgents said the advantage lay in taking up positions where they could carry out hit-and-run operations, rather than holding a location without tactical or strategic value. Insurgents briefly held the position, which overlooks villages and hilltops, in a spring offensive near the Mediterranean coast. Another sign of how the US may have undermined its declared strategy for airstrikes, as its Tuesday attacks on the Islamist faction Jabhat al-Nusra may strengthen the Islamic State — the supposed target of the American campaign…. US missiles killed more than 60 Jabhat al-Nusra fighters in attacks in Idlib and Aleppo Provinces on Tuesday. Jabhat al-Nusra split with the Islamic State in April 2013 when the latter group tried to claim authority over the jihadist movement inside Syria. I know Joulani. He would never reconcile with Islamic State. If he ever does it, it would be in a direct order from the leadership, and that is [Al Qa’eda leader Ayman al-] Zawahiri himself. One Islamic State fighter said he believed there was an “80% chance that the brothers of Nusra will join the State”. This goes without saying, this is a crusader war that includes all infidel nations against the Islamic State. Regardless of what happened between us, they remain our brothers, and the ideological bond between us is stronger than anything. We are ready to fight by their side….Our blood is their blood. Lebanon’s Army Mass Detention Near Arsal: Crackdown on “Militants” or “Collective Punishment” of Syrian Refugees? The Lebanese Army’s mass detention of Syrians near the border town of Arsal has raised tensions. Authorities claim that they are dealing with “militiants” who killed and abducted soldiers in fighting last month, and relatives and activists alleging “collective punishment” of innocent refugees in camps. We condemn the attacks on the Army but the collective punishment of Syrian refugees cannot be justified. We call for a transparent and impartial investigation of the violations, from the burning of camps to the torturing of detainees in Arsal. The head of the opposition Syrian National Coalition, Hadi al-Bahra, called on UN Secretary-General Ban Ki-moon to protect the population and investigate the incident. The military said that it had arrested 22 individuals on suspicion of membership in terrorist groups. It claimed that any burning of the camps was by others, saying it arrested three individuals on a motorcycle trying to raze a tented settlement. Meanwhile, families of soldiers held captive by the Islamic State and the Syrian insurgent faction Jabhat al-Nusra protested by blocking highways linking the capital Beirut to Tripoli and the Bekaa Valley. In August, gunmen of the Islamic State and Jabhat al-Nusra battled Lebanese troops, with at least 19 soldiers and scores of gunmen killed. Nearby camps were set ablaze by artillery bombardment. The gunmen took away at least 24 Lebanese troops. At least three have subsequently been executed — two by the Islamic State and one by Jabhat al-Nusra. Syrian State news agency briefly declares victory in Adra, a city of about 150,000 people 12 miles north of Damascus, “Worker City of Adra Ends the Page of Black Terrorism“. The military declared earlier that it had established full control of Adra, taken by insurgents last December, “killing numbers of terrorists” and “sweeping the city for explosives and mines”. The regime will seek to use the advance to put further pressure on insurgent-held parts of the East Ghouta area near Damascus. Last month, the Syrian military claimed another key town, Mleha. The area has been besieged by the Syrian military since July 2013, when insurgents took over most of Yarmouk. More than 120 people died from lack of food and/or medicine this winter, and supplies continue to be restricted. 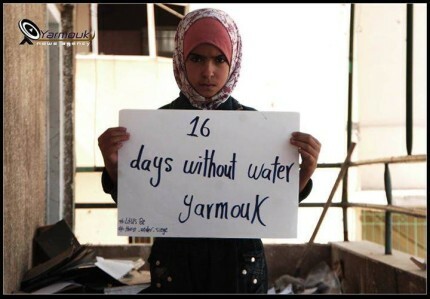 Even before the cutoff of water earlier this month, services were limited — according to activists, as part of the regime’s continuing strategy to break opposition in Yarmouk.